Another case of paratesticular leiomyosarcoma in an elderly male. The spindle cells have abundant brightly eosinophilic cytoplasm. Some nuclei have tapering ends, where as others are blunt-ended. Treatment & Prognosis: Most cases of paratesticular leiomyosarcomas get treated by radical orchiectomy. Adjuvant radiation therapy has been advocated to reduce local recurrences. Low-grade tumors rarely recur or metastasize, behave indolently, and have overall excellent prognosis. High-grade tumors recur or spread to lymph nodes, lungs, or liver in about a third of cases. Ref: Fisher C et al. 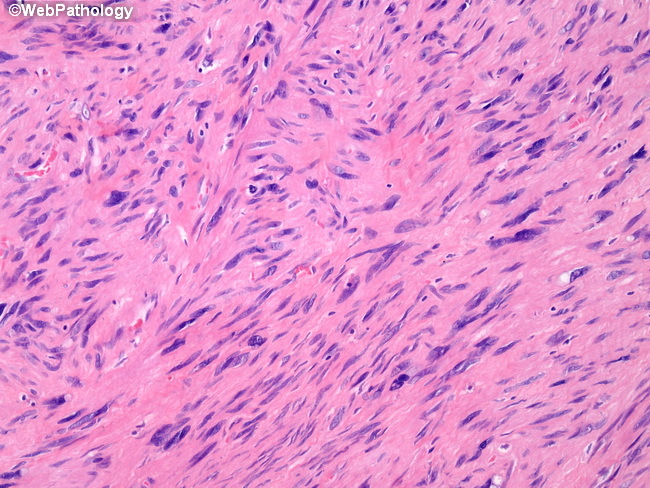 Leiomyosarcoma of the Paratesticular Region: A Clinicopathologic Study. Am J Surg Pathol 25(9):1143-1149, Sept. 2001.